Under the able captaincy of CF Cropley, the School First XI have enjoyed yet another successful season, winning eleven matches and losing three. We were beaten by Saffron Walden and Thetford away; the latter's performance in beating the School deserves high praise as we had already defeated them at home by seven goals to two. Perhaps our greatest shock came in the first match at Newmarket when we were 3-2 down five minutes from time and were only rescued by two good goals from Gammon in literally the closing seconds of the match. Six of last year's unbeaten team were available, namely, Cropley, Burton, Cox A, Gammon, Moore and Ellingham; and Goodchild, Simper, Blake, Chilcott and Herod filled the remaining places very satisfactorily. Burton, who had played so well on the right wing for the past two seasons, was moved to the inside position where he immediately became the mainspring of the forward line. Cropley played strongly at left half to maintain the balance of the side, and Moore moved from right back to centre half. The rest of the team were built around these three. All the "new boys" pulled their weight; Herod at left back was consistently sound, Simper and Blake improved as time went on, and Ellingham kept a very good goal. Cox A has once again made himself into an effective left winger and Goodchild solved our right wing problem better than we expected. Many a time it has been said that the strength of the first team lies in the quality of its reserves; as far as we are concerned this must be an understatement. The second eleven has remained unbeaten for five years, and during that time the first eleven has had a great run of success. The members of the second eleven are the unsung heroes of the piece, and to Thompson, Tassell, Parr, Cox E and others who would have gained their first eleven places in a normal year grateful thanks are due. The under-fourteen eleven started the season disastrously and finished up all square. Under Mr Kitchen's guidance they improved throughout the term so much so that after losing to March at home 11-3, they won away 2-1. They are a young under-fourteen eleven and many of them will be available for this team next year. The under-fifteen eleven won both their matches against Saffron Walden, and the under-thirteen eleven had the better of two very enjoyable encounters with St. Faith's. First eleven colours have been awarded to Chilcott, Ellingham, Gammon, Herod and Simper. The School went to Saffron Walden knowing that they could expect a hard game. It started off at a furious pace with the light ball swinging rapidly from end to end. We had the best of the mid-field play mainly because the quick, hard tackling of our defence upset the opposing forwards. Unfortunately, the School's forward line were unable to do any better against the Friends' School defence which always retreated to its penalty area before attempting to break up our attacks. This prevented any really good shots at goal. Their inside-left scored what was to be the only goal of the match when he cracked in the ball from a corner. Towards the end of the match, the School dominated the play, but with the whole of the Saffron Walden team packing their defence, we were unable to score, and so lost the unbeaten record which had lasted for more than a season. Praise must go to Ellingham and Moore for fine work in defence, and to Burton who was outstanding in our forward line. Nov 7 School v Newmarket GS (home). Won 3-0 (Gammon 2, Burton). The School usually expect to defeat Newmarket on their own pitch and we faced this game full of confidence. By half-time, our confidence had gone. Our goal had survived several near misses whilst at the other end, none of our forwards could boast of having had a good shot at goal. Shortly after half-time, however, many boys came to watch and gave vocal support. This encouraged our team to make greater efforts, and Burton ran through the Newmarket defence beating three men on the way to score our first goal. Gammon added a second with an excellent shot into the corner of the net and Gammon made the score three just before the final whistle blew. Instead of the fixture against March GS the School team together with representatives from March and Wisbech played in a trial match for places in the County Grammar Schools' team. Five members of the School team were afterwards selected - Cropley, Moore, Burton, Herod and Simper. The game was played in appalling conditions. Heavy rain had fallen throughout the whole night and morning before the match, and the Newport pitch was waterlogged. Because of this, the School's usual short passing game was not effective. Consequently our attacks would peter out before a shot had been fired at goal. The Newport side were favouring the long pass down the wing, and it was from one of these passes that their right winger was able to centre the ball and see it headed into the back of our net. This goal enlivened our forwards, and Cox, after a solo run on the left, levelled the scores with a shot into the top corner of the net. The School continued to attack strongly, and with Burton prompting the rest of the forwards with many well placed passes, it was only a question of time before we scored again. However, our second goal was not scored until shortly before half time, when the Newport goalkeeper completely misjudged a ground shot from Cox. After half time Newport attacked strongly, but our defence, playing its usual steady game, managed to weather the storm. Gradually the School became on top again, but we were unable to increase our lead before the match ended. Playing downhill, the School dominated the play in the first half to such an extent that the 4-0 lead they gained in no way flattered them. Saffron Walden showed little cohesion and were outplayed in mid-field. After the resumption the tables were dramatically turned and three quick goals put the visitors back in the game with a chance. Burton headed in from a Cox corner but one of the two excellent Saffron Walden inside forwards soon cut the lead once more to single goal. Cox, however, settled the issue with a finely judged lob and for the remainder of the game the School were in command again. After the first few minutes it was obvious that the School were going to be hampered by a poor playing surface and opponents who played the ball first time regardless of its direction. In spite of these handicaps Goodchild scored the only goal of the first half. Soon after the resumption Burton hit the second goal from twenty yards. But Thetford retaliated and even Ellingham's fine goalkeeping could not prevent them from scoring four quick goals and although Burton added a third for the School, Thetford scored again to clinch the match by 5-3. The first half produced some of the quickest and most constructive football played by the School team. The result of this was that by half-time the School had scored 5 goals. In the second half the School slackened the pace and Huntingdon scored a goal. 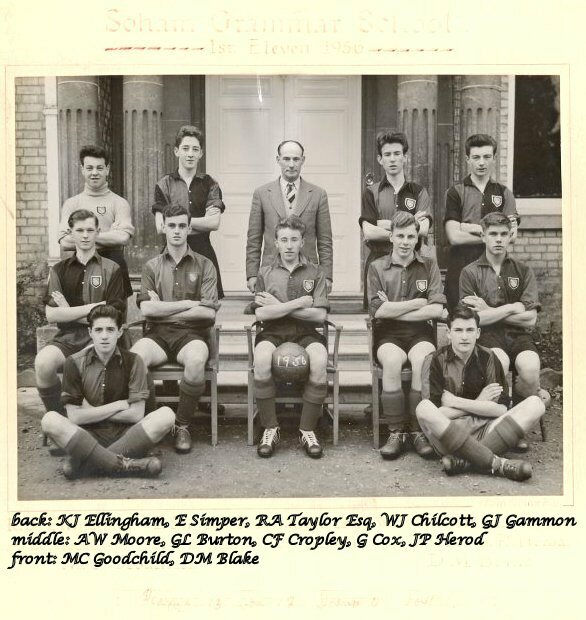 But Gammon, who was shooting powerfully and accurately, scored 2 more goals to make the final score 7-1 and to equal the highest number of goals scored by an individual player in a school season - 32. The Old Boys had gathered together one of their strongest teams ever. Nevertheless, since the HM had openly declared in Assembly that he thought the School would be beaten 4-2, the whole team were determined to win. We kicked off uphill and into a near gale. For the first twenty minutes, our defence held out, but we were unable to make much progress into the wind. The Old Boys settled down remarkably quickly considering that they had not played together as a team before, and after several missed chances, Kendall opened their scoring after a solo run. Fuller soon added another, and it seemed likely that the School might be over-run. No more goals were scored before half-time, however, and we thought that we had done well to change over only two goals down. With the wind in our favour, the forwards began to see more of the ball, and Goodchild, running to a pass from Gammon, scored with a fine shot. The Old Boys were playing much better into the wind than the School had. South and Fordham were combining well and danger often threatened our goal. When Burton was injured, our attacks became few and far between despite valiant work by Cropley who tried to combine the positions of left-half and inside-left. Before the match ended, the Old Boys scored twice more through Kendall and Fordham, the School only replying with a close-in shot from Simper.